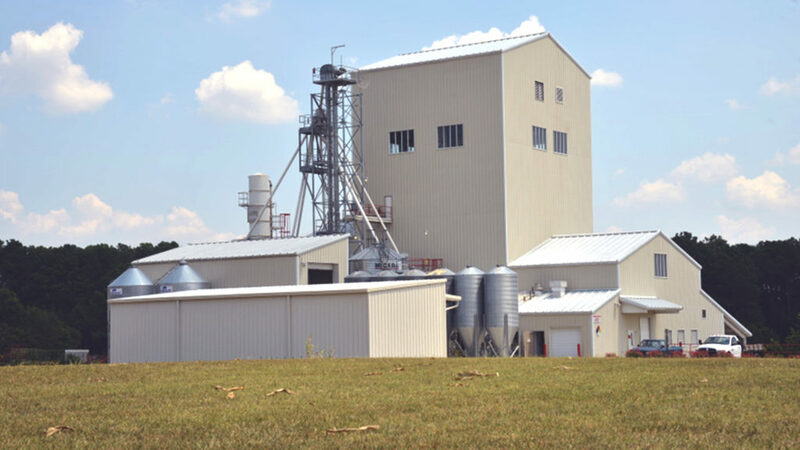 The concept of a Teaching and Research Feed Mill at NC State University started in the early 1990s when the Poultry Science department identified the need to replace their 1950s-era poultry feed mill. The concept was expanded from a single-species mill (poultry) to a feed mill that could manufacture feed for all of the animals at the Lake Wheeler Road Field Laboratory. The feed mill was designed to meet the teaching and research needs of the departments of Poultry Science, Animal Science and Biological and Agricultural Engineering. A ground-breaking ceremony was held May 24, 1999. Building construction started in 2001 and finished in 2003. Equipment was purchased between 2004 and 2006. Installation began in 2006 and finished in Fall 2007. The NC State University Feed Mill Education Unit was dedicated on October 31, 2007. Faculty and staff began conducting research and teaching students how to operate the equipment in January of 2008. Contact Dr. Fahrenholz for information about conducting research projects at the Feed Mill Education Unit or in any of the animal units.